This is the last photo in this series on the Crystal Sands condo building. I hope you have found it of interest and that I have not gone on too long for your tastes with this series, but there was a lot to show, with the exterior, interior of the model unit, one of the penthouse units, and views of the ocean, beach, and hills. Tomorrow is the first day of the month Daily Photo theme day, and the theme this month is perfect for Costa Rica, and I will expand upon it for a week of posts. We are showing photos of Egypt this week on our Viva la Voyage travel photo site. Before leaving the Crystal Sands condo, I took this look back and photographed the entrance. This is what a real estate salesperson would describe as curb appeal. Anyone driving through the gate and pulling up to this entrance will understand that this is a very nice, and expensive place. This is a closer view of yesterday's scene, taken with a zoom lens. The white building is the Pacific Park condo. I would prefer that they had used an earth tone that does not stand out so much. You can see that some people like to have houses up on the hills to get a nice view of the ocean, although they cannot walk to the beach. The radio tower on the top of the hill is a nice place from which to watch the sunset over the bay, and tourists can take ATV tours up there. The tan colored building on the left are the condo buildings at the Diria Resort complex right on the middle of Tamarindo beach. One of our two condos is on the fourth floor of that building. It is very popular with guests who want to be in the middle of town and to have access to the amenities of a resort. In fact, the Canadian couple who are just finishing staying in my condo for 3 weeks this January, and who also stayed there for 3 weeks last January have already reserved the condo for 3 weeks next January. And they previously stayed at the Diria Resort every January for about 10 years. It is nice to have repeat visitors. Today is Sunday, so we have new photos posted on our Viva la Voyage travel photo site this week we are showing some remarkable sights of Egypt, ancient and modern. Yesterday's photo looked towards Langosta, so today I am showing this photo of the view from Langosta towards the main part of Tamarindo. You can see that with the boom of condo development beginning about 10 years ago, Tamarindo has developed a little of what one might call a skyline. Fortunately, there are still lots of trees. Development controls now require that every development near the beach leave half of the land in vegetation. We are showing photos of Chicago at night on our Viva la Voyage travel photo site this week. This is a view of Langosta from the elevator lobby area of the top floor of the Crystal Sands condo. This is looking in the opposite direction from the beach. The Cala Luna Resort is located in foreground. The tile roofs are the resort bungalo units. The tall thatched roof is the snack bar near the swimming pool. The Cala Luna has recently been remodeled and reopened. We like to walk there from our condo to enjoy lunch at their restaurant around their pool. The Peninsula and Naxos condos are the tall buildings on the left side of the photo. Our condo is on the beach near the top right of the photo, although it is not visible due to the trees. Yesterday I talked about how beachfront trees at times will be damaged or die because of the salt air. This is a closer view of the tree that was visible in yesterday's photo. 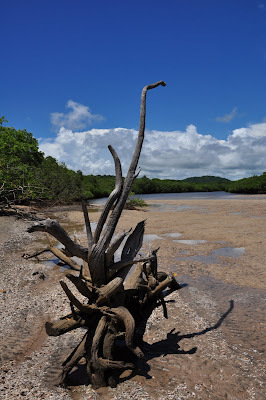 The dead trees have a rather artistic shape and can make for interesting driftwood. Someone has added a chair swing to this tree. 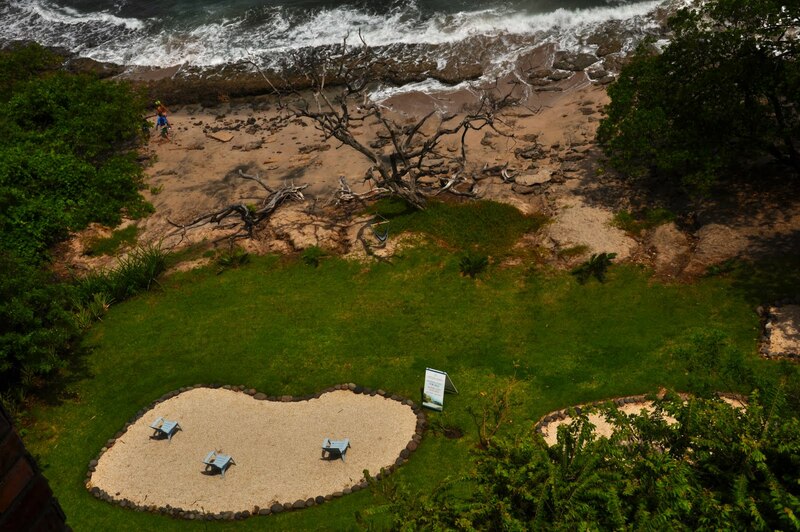 This is a view from the penthouse balcony down to the beach. The Crystal Sands condo has a nice lawn overlooking the beach, but I guess they figured that people would rather sit with their feet in the sand, so they made a couple of sand boxes with lounge chairs. At the center top of the photo is a dead tree. I wonder if someone killed the tree to make a better view of the ocean. Some people in our condo building would prefer there there is less vegetation on the beach, but our property management company has quite properly said that they will not touch the trees on the public property of the beach. The Costa Rican environmental authorities have threatened to penalize anyone who who damages the beach trees. The vegetation along the beach at times is damaged naturally by the salt air and water. The trees can be fragile because they are growing in sand. I mentioned yesterday that some of the trees have red flowers at the tips of their branches. Here is a closer view of the same trees shown yesterday. I took these photos several photos months ago during what we call the "green season." During January - March some trees will turn brown and drop their leaves because we get almost no rainfall from November until April. Of course, that is fine with the tourists who enjoy the warm sunny weather during the cold months up north. Here is another view of the beach from the Crystal Sands condo penthouse balcony. The lush greenery comes very close to the beach, and you can see some red flowers in bloom on the tree tops. I visited the Crystal Sands condo twice, once at low tide and once at high tide. If you look at the photo of the hot tub on the balcony compared to the same scene visible in this photo, you can see the large difference between low tide and high tide. The top of this photo is the point that divides Langosta Beach from Tamarindo Bay. Sometimes we walk from our Langosta beach condo around this point, and then walk along Langosta beach to one of the many restaurants in the middle of Tamarindo. It is nice to be able to walk to dinner along the beach. We walk along the road on the way back at night after dinner, of course. I took this photo from the balcony at the Crystal Sands. It shows Isla Capitan, or Captain Island, at high tide, when it is barely visible. This island and the rocky reef around it shelter the southern end of Tamarindo Bay, allowing boats to be moored in the harbor and making the waves at the southern end of the bay gentle and perfect for small children to swim. The island provides a place to roost for pelicans and other sea birds, and I am sure the marine live loves the rocky terrain and tidepools. Today is Sunday, so we have new photos on our Viva la Voyage travel photo site. This week we are showing nighttime photos of Chicago, featuring the Theater District and the distinctive architecture of Chicago. I mentioned a couple of days ago that there are hot tubs on the balconies of some of the condo units at the Crystal Sands. 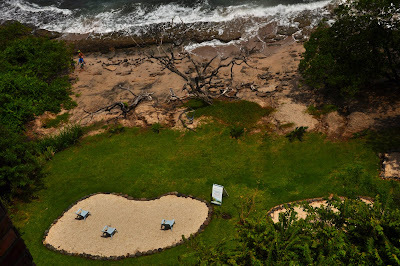 Here is a photo of one of them, with the view down to the ocean at low tide. Of course, in Costa Rica, it is warm all year around, so I don't know if people actually want to turn up the heat in a hot tub, but I guess it is nice to have the option. We have a spa next to the pool at our house in Scottsdale, but we never use it. We don't sit still long enough, unless we are in front of a computer. Behind the wall in yesterday's photo is this shower, with a full length view of the ocean. You don't have to worry about anyone looking in the window when you shower, as there is no one 6 stories up out on the beach. The disadvantage of a shower such as this is that I would not want to take my glasses off to take a shower, asI would want to continue to see the view. This is part of the master bathroom in a penthouse unit of the Crystal Sands condo. Here's a problem that I foresee with this bathroom area. What if the wife picks out her clothes and asks "Honey, how do I look?" Or the husband picks out some clothes as asks "Does this shirt go with these pants?" The response will probably be "I don't know, and I don't care. I'm enjoying the view of the ocean." This is a penthouse unit at the Crystal Sands condo. It is 2 stories, 4,700 sq. ft. (440 sq. m). You have missed your chance to buy one, as this was the last one available, but it is now under contract. Sorry. You will have to use your extra $1.6 million to find another property. This is the view from the front door, with a large living room straight ahead and a staircase to a huge master bedroom suite that occupies the top floor, with a jacuzzi out on the balcony. Since you missed your chance to buy this unit, I'll show a couple of more photos during the next few days. This photo is the swimming pool at the Crystal Sands condo. What is very unusual about this pool is that it is on the opposite side of the building from the ocean. Usually, beachfront condos have the swimming pool overlooking the beach. There are two reasons this pool is on the road side of the building rather than the beach side. First, it allows the building to be closer to the beach, as there does not need to be space for a pool on the ocean side. Second, by not having a pool on the ocean side, the condos on the ground floor do not have the people around the pool next to their patios overlooking the ocean. Our condo has the pool next to the beach. It make it very pleasant to be at the pool and to look over the ocean. However, for people who own condos on the ground floor next to the pool, they have no privacy on their patios. Their patios are right next to all of the people who are hanging out by the pool. We are very pleased to have our balcony on the second floor, not next to the pool. If I had a condo on the ground floor, I would be pleased that the pool is on the street side. If I had a condo on a higher floor, I think I would want a the pool on the ocean side. This view gives a perspective on how close condos can be to the ocean (50 meters) if they are on property that was grandfathered before the law required buildings to be set back 200 meters from the ocean. There is something missing from this photo, however. There is something unusual about the layout of the outdoor public space at the Crystal Sands condo. I will show you . . . tomorrow. Several people yesterday commented that they liked the view of the balcony from the bedroom. Here is a better view of the balcony of the model apartment in the Crystal Sands condo. This gives an idea of how large the 3-bedroom condos are (2,800 sq. ft.; 265 sq. m.). There is a long exposure of the condos to the ocean front, as this entire balcony belongs to the same condo. If you have about $900,000 USD, this could be yours. In a couple of days I will show you one of the 4 penthouse units. Today is Sunday, so we have new photos posted on our Viva la Voyage travel photo site. This week we are showing some scenes for Egypt, including some phtos of the old Coptic Christian area of Cairo. Here is the master bedroom of the model apartment in the Crystal Sands condo building that I have been showing for the past week. The model is on a lower floor, compared to the view that I showed yesterday. The Crystal Sands is built as close to the beach as the law allows -- 50 meters. Similar to our Langosta Beach condo, it is on land that was grandfathered before the law required new buildings to be set back 200 meters from the ocean. Even close to the beach, however, there are still trees along the beach, as you can see from this view. This week we are showing photos of the patterns in the animals and plants of Tanzania on our Viva la Voyage travel photo site. This is the view to the right from the same balcony from which I took yesterday's photo of the view out to sea. This is the view of the northern tip of Langosta beach at San Francisco point, then the small Isla Capitan, barely above the water line at high tide when this photo was taken, and across Tamarindo Bay to Cabo Velas. A couple of people strolling along Langosta beach are visible. That is typical for Langosta, a couple of people, not crowds, enjoying a walk on the beach. If you own or rent a condo on a high floor of the Crystal Sands condo, this is your view of a part of Langosta Beach, out to sea. This view of the ocean gives me an opportunity to mention that there is an article in the newspaper about a 56 year old German woman, Renate Herberger, who is swimming the entire 1,000 km (600 miles) length of the Costa Rican coast of the Pacific Ocean. She wears a face mask and flippers so she can enjoy the marine life. She gives talks to local people and school groups along the way to increase awareness and appreciation for marine life. When she has a support boat, she takes short breaks every half hour in her 8 hour swim days. Some days, she swims by herself without a support boat. The newspaper said people can email to her at renatemermaid@gmail.com. What a wonderful, dedicated human being. Here is a link to the newspaper article about her. Here is the dining room and kitchen of the Crystal Sands condos. Because condos on the beach in Costa Rica are marketed primarily to Americans and Canadians, the upscale condos have kitchens that are equivalent to what people would expect in the USA and Canada. Stainless steel appliances, dishwashers, garbage disposals, etc. are common in upscale beach condos. I also like the cabinetry made from local hardwoods. Here is a view of the dining and living room of one of the larger condos in the Crystal Sands building. As you can see, it is large and luxurious. The 3 bedroom condos are large, 3,000 sq. ft. (285 sq. m.), with luxury features. We'll take another look inside tomorrow. When I stepped out of the elevator on a high floor of the Crystal Sands condo building, I saw this moth on the wall right next to the elevator door. 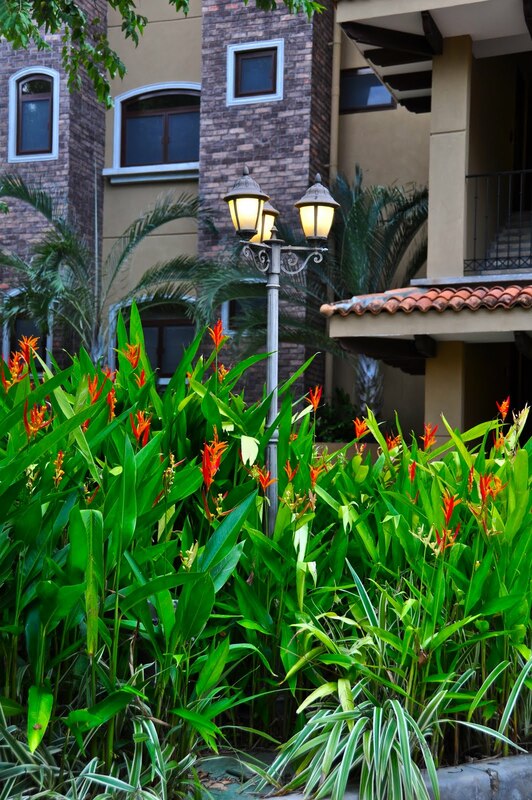 Despite being a high price condo, with lots of luxury features, an underground parking garage, and a security guard and gate out front, this is Costa Rica, after all. There's a jungle out there. We have seen a pack of monkeys in the trees just one block from this condo. The markings on this moth are intended to confuse predators by camouflaging the location of its eyes. If a bird attacks the moth, it might take a bite out of its wing instead of its head. Tomorrow, several readers expressed an interest in seeing what the inside of million dollar condos look like , so tomorrow and the following days we will go inside and I will show you the interior. This week we have photos of some of the patterns of animals and plants in Tanzania on our Viva la Voyage travel photo site. 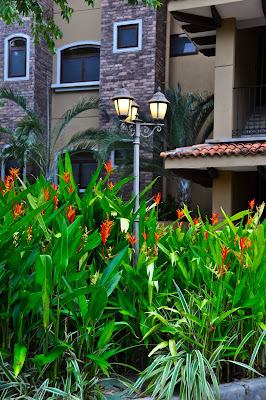 Like most condos in Costa Rica, the corridors at Crystal Sands are open air, rather than indoors. They have used local woods for the ceiling, which are quite attractive. On the day I took the elevator up to a higher floor to look around, I found a reminder that we are in Costa Rica, as I will show you tomorrow. Airport News Update: A week or so ago I showed some photos of the new airport terminal in Liberia. The newspaper has an article that the new terminal will open next Thursday. The company that built the terminal and has a 20 year concession to operate it will pay a fine of $500,000 for the delay in opening. The company will pay $229 million to the government, which will use the money to upgrade small, rural airports all over the country. Today is Sunday, so we have new photos on our Viva la Voyage travel photo site. This week we are showing some photos of patterns from our safari in Tanzania, Africa. If you owned a ground floor condo at Crystal Sands, your front door would be either on the left or right of this walkway, with the beach right beyond the trees visible through this atrium. The smaller condos on the lower floors of this building go for about $800,000, with penthouse units on the top two floor approaching $2 million. The condo has underground reserved parking, which is nice. There are a lot of nice architectural touches to the exterior common areas as well as the interior of the condos, as one would expect with top of the market condos. This week we are showing some close up photos of plants and animals of Cape Breton Island, Nova Scotia, on our Viva la Voyage travel photo site. During the past few days I have shown photos of the pristine aspects of Langosta Beach. But a beach that beautiful in places yields to the pressure of development. This is a photo of the entrance to the Crystal Sands condo, the largest building, by far, on Langosta Beach. The ocean is right behind the condo. This is a very upscale condo, with prices ranging from $900,000 to about $1.7 million. It was developed by several Americans who had the bad luck to finish the building just as the global real estate market collapsed. Even with the soft market, however, they have sold about half of the condos. Would you like to see more of what luxury condos are like in the Playa Langosta area of Tamarindo? My wife and I took a look inside the Crystal Sands, with our camera of course, during our last visit to Costa Rica. I mentioned yesterday that driftwood at times washes up on the Langosta beach. Here is a particularly artistic example. This driftwood is in sand that is exposed at low tide in the mouth of the Langosta estuary. I do not know whether this driftwood was carried in from the ocean or floated down the estuary. Its weight must have caused it to stand upright as the tide receded, which made for a better composition for this photo. One of the things I love about Langosta beach where one of our 2 condos is located is that we can walk up and down the beach and see nothing but surf, sand, sky, plants, and driftwood. No buildings or people are visible. There are some houses behind the trees that line the beach, but you have to look straight inland to see them, otherwise the vegetation is think enough to block the view of them. In the future I will show some photos of the beachfront houses. Some of them are spectacular. We like to watch pelicans flying up and down the beach from our condo. Unless I have my camera with me, there is no use trying to run inside the condo to grab the camera, turn it on, set the exposure and try to take a photo. They will be too far to photograph. Fortunately, I had my camera with me when these pelicans flew by in their typical "V" flying formation. Pelicans do not migrate like birds who fly south for the winter, but they can forage long distances, up to 93 miles (150 km) for food. I think that the pelicans that we have in Costa Rica are brown pelicans, the same species as in Florida or California. We often see them plunge diving into the ocean for food, which is a characteristic of brown pelicans. Pelicans are ancient creatures, as fossils reveal that they lived as long as 30 million years ago. They were almost wiped out in the USA in the middle of the 20th century, as DDT use caused their egg shells to be too thin to hatch. Thank heavens for Rachel Carson and her groundbreaking book, The Silent Spring, which awoke mankind to the dangers of unregulated pesticide use. Several years ago this Hilton Garden Inn opened up across the street from the Liberia Airport. I am sure that it is used by all of the airplane crews. Before this opened, the nearest upscale accommodations would be at beach resorts about 45 minutes away. Some of the departing flights to the USA leave as early as 7:00 am, so some tourists prefer to go to this hotel the evening before departure so that they do not have to make an early morning drive to the airport. There was an article in the Costa Rican newspaper about a week ago that reported that tourism in Costa Rica in 2011 was up about 4%, which is good considering the condition of the economy in the USA, Costa Rica's largest market for visitors. There were about 2 million visitors, to a country with a little over 4 million population. In anticipation of the new terminal at the Liberia airport, recently new nonstop service was added to Liberia from Denver, Minneapolis, New York and even a flight from Germany. The addition of nonstop service from Europe is new and significant. I have noticed an increase in European visitors, as this past year three of the people who rented my condos were European, whereas in the previous three years I had only one European guest. This week we are showing photos of some close up photos of plants and animals of Cape Breton Island, Nova Scotia, on our Viva la Voyage travel photo site. Today's worldwide Daily Photo theme is the favorite photo of 2011. 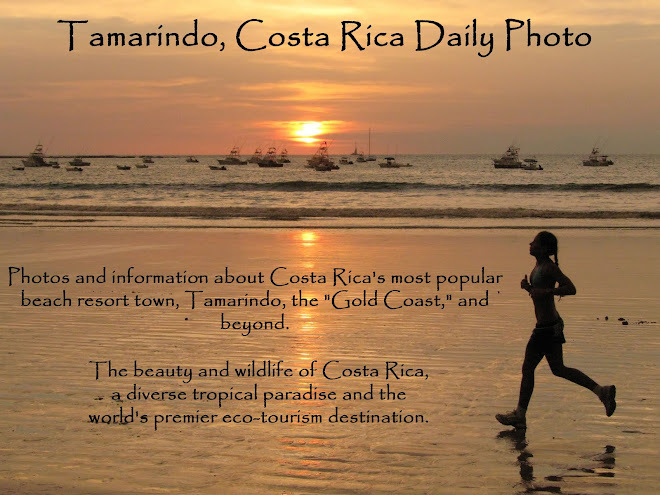 For my choice, I selected what I had described as a photographer's dilemma, because I do not normally take photos of women lying around in swim suits, which is a common sight in a beach resort such as Tamarindo. But while I was taking photos of this dog on the beach, the dog became curious about this woman, which gave me a brief moment to decide whether to take this photo of, yes, the dog. It was a very brief photo opportunity, as this woman quickly sensed the breath on her chest and her reaction caused this too-friendly dog to wander off . While my wife might think it is not appropriate to take photos of sun bathers, my mother-in-law loves photos of dogs. I decided to seek to please my mother-in-law by reacting quickly and taking this photo. She approved. Whenever we travel, I try to take a least a couple of photos of dogs in distinctive foreign locations and my mother-in-law keeps several albums of my dogs-around-the-world photos on her coffee table. Yes, her affinity for dogs borders on an obsession, from the other side of the border. Today is Sunday, so we have new photos on our Viva la Voyage travel photo site. This week my wife has posted some macro photos of plants and a very unusual animal on Cape Breton Island, Nova Scotia, Canada.